This is yet another story about the slip between the cup and the lip. And the ultimate sufferers in this case are the residents of Delhi, who are left choking with polluted air and a hazy future. It all started in 1998, when the Environment Pollution Prevention and Control Authority ( EPCA) , concerned by the rising air pollution levels in the city, approached the Supreme Court for the construction of two fuel testing labs. The Supreme Court in an order dated July 28, 1998, ordered the setting up of two independent fuel testing labs. As far as the finances were concerned, it was decided that the oil companies would bear the cost of setting up the lab while the automobile industry would bear the operational costs. Two years after the order one testing centre has been set up but is non-functional because the automobile industry has refused to stick to its commitment. At the time of going to press, the EPCA has decided that since the automobile industry had reneged on the deal, some government ministries would have to share the burden. “There will be three or four constituting units that will chip in for the operational costs of the lab. The automobile industry will also be a part of it and if they don’t pay their share we can take them to court,” Bhure Lal, chairperson of EPCA , told Down To Earth , without divulging the name of the constituent units. Fuel testing labs are not a new concept. Companies like Bharat Petroleum Corporation Limited and Indian Oil Company ( IOC ) all have their individual laboratories. The oil companies also have mobile vans to conduct surprise tests on a regular basis. But what these tests lack is objectivity because being both producer and distributors, there is a slim chance that they would publicise the names of the retailers distributing adulterated fuel. The automobile industry has always maintained that it is not their engines but adulterated fuel that is leading to air pollution. And they are right to a certain extent. The rate of adulteration by petrol pump owners is extremely high in New Delhi. This might have a role to play in total vehicular emissions which form 70 per cent of the total pollution in the city and this has provided the auto industry with the excuse that their cars pollute because of rampant adulteration. Experts say that this accusation is partly true because Indian car engines are not sensitive to adulteration of fuel. According to some informal studies done by the city’s non-governmental organisations, a majority of the city’s petrol pumps sell solvent adulterated petrol and diesel mixed with kerosene. It was found that though only a specific amount of petrol and diesel was supplied to the petrol pumps by oil companies every month, the amount sold by most of the petrol pumps was much higher than the stipulated amount. The trend is so widespread that in some petrol pumps the difference between the quotas and the actual amounts sold was found to be as much as one lakh litres per month. In western countries, vehicles have electronically-controlled fuel injection and combustion systems that not only control the air-fuel mixture, but are also sensitive to hydrocarbons burnt in these vehicles. So if adulterated fuel is used in these vehicles, the engine power/driving efficiency will be immediately affected. 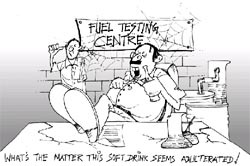 The main adulterants used in petrol are kerosene, hexane and naptha. For adulterating diesel, mainly kerosene is used. To discourage the adulteration of diesel by kerosene, the government tried to reduce the gap between diesel and kerosene prices, but this policy was not followed consistently and in the last few years the difference in diesel and kerosene prices had widened rapidly. This warped pricing policy also leads to adulteration. “While kerosene sells for Rs 2.35, diesel costs Rs 11 or Rs 12 and petrol around Rs 26.07 a litre. If a dealer gets caught, we suspend him for sometime and can even terminate his licence. But at the end of the day it is definitely the duty of the government to enforce the standards and change this fuel pricing policy,” says S K Mukherjee, chief quality manager, IOC. Initiatives by refineries like colouring the kerosene blue to prevent it being used for adulteration purposes has not been able to put an end to this illegal activity. The pump owners use additives to remove the blue colour in collodial forms and then use the non-coloured kerosene for adulteration. “The pump owners change their tactics and solvents quite often whenever they get caught,” adds Mukherjee. “Though oil companies have mobile fuel testing labs, the onus is on the state government to check adulteration. When we supply the product we make sure that it meets the Bureau of Indian Standards’ specifications. Despite this we try to keep a check on adulteration,” says Mukherjee. For the moment, a solution is a distant dream. The deadlock over funds continues. “The oil industry was supposed to pay the costs of setting up the testing facility. And they have done so. The automobile industry was supposed to bear the operational costs of the lab. This would work out to Rs 3 crore per year. But now the auto industry, represented by Society of Indian Automobile Manufacturers ( SIAM) has backed out saying that the members involved cannot bear the costs because all members will not be able to pay. They have only agreed to pay a one-time amount of Rs one crore,” says an official at the petroleum ministry. There is another fallout of this delay. The one-year warranty period for the sophisticated instruments, some foreign and some Indian, is coming to an end. If a part needs to be replaced it will not be covered by the warranty after the year ends. “We have also received a letter from Indian Institute of Petroleum warning us that the instruments are lying idle and should be used immediately. On our part, we have written to the ministry of heavy industries to force SIAM to honour their commitment,” adds a source at the petroleum ministry. There is also some confusion over collection of samples. “Since the main motive for setting up the lab was to have an independent authority, the EPCA , Central Pollution Control Board and the Delhi government were supposed to send their own functionaries to collect samples. But now the EPCA says that they have no regular staff to do so,” says Shastri. But what happens to the sophisticated lab instruments lying idle? “The equipment is very sensitive but there is an annual maintenance contract which will take care of problems,” says K S Jhauri, area leader and industrial liaison officer. Till the time the issue is resolved petrol pump owners supplying adulterated fuel can go about their business with impunity.